Chancellor George Osborne is to reprivatise RBS, but has held back from scrapping a bank levy that is prompting HSBC to consider redomiciling. Both decisions could mean a loss for the taxpayer. But selling RBS makes long-term sense, and there’s still scope to keep HSBC in the UK. UK Chancellor of the Exchequer George Osborne on June 10 told an audience of London bankers that the reprivatisation of the government’s 32 billion pound ($49 billion) stake in Royal Bank of Scotland would start “in the coming months”. Osborne, speaking at his annual Mansion House speech to financiers in the City of London, talked of a “new settlement” with the UK’s financial services industry. “I want Britain to be the best place for European and global bank HQs,” he said. 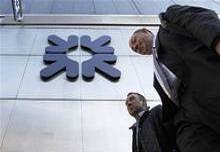 An independent review conducted by Rothschild said that taxpayers were likely to lose 7.2 billion pounds on RBS based on its current share price, though they would make a profit overall from the UK’s bank rescue programme once the repayment of fees is factored in.